So here we are, deep in the non-scootering months. But, with yesterday's warm weather (nearly 40 degrees F, downright tropical), I decided to do a little maintenance on the Symba. The Symba has tubed tires, similar to a bicycle, and awhile back I had picked up some Kenda Tuff Tubes so as to be ready for any flat tires. The advantage to tubed tires is that you don't have to replace the whole tire in case of a flat, but the disadvantage is that tubes go flat more easily than a tubeless tire. The Kenda tubes are thicker than the stock tubes, so hopefully the new tubes will make a flat less likely. I have yet to actually have a flat, so I decided that this winter I would install the Kenda tubes and gain some practice changing tubes when I'm not trying to get back on the road as soon as possible. So, taking advantage of the brief warm spell, I started yesterday with the front wheel. 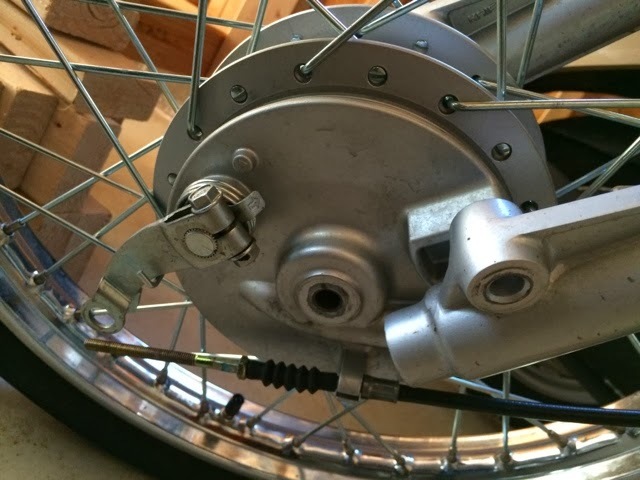 The front wheel is easier to remove, as removing the rear wheel requires first removing the exhaust. Taking off the wheel wasn't too difficult, and I then took the wheel inside for the tube change. It took a little work to get one side of the tire off the rim, but I soon figured out it was easiest to hold the tire down with one knee and then pry the tire up with a tire iron. At that point I could pull out the old tube. Nothing wrong with it, so I'll keep it on hand as a spare. I inflated the new tube a little - everything I read online said this makes it easier to put the tube in without pinching it. It certainly did, and then I just had to push the edge of the tire back over the rim. With the tire on the floor I was able to do this by hand, without using the tire irons (preferable because that reduces the chances of puncturing the tube). Then the wheel went back on, good to go. The rear wheel will have to wait for another stretch of warmer weather, as today we're back below zero. My goal with the Symba has been to learn how to do as much as the maintenance myself as I can. Most things are easy to get to on the Symba, which makes it a great do-it-yourself bike. So now I've added tubes changes to my repertoire. I hope to never have to deal with a flat tire on the side of the road, but at least now I'm familiar with the procedure, with some help from this step-by-step guide on the ADVRider forum. It started innocently enough. The dog went downstairs first, as usual, to wait by the back door while we all got ready. Then we heard noises. The Coffee Queen went downstairs and caught the dog in the act: fully one-third of the gingerbread cookies had been eaten. The cookies she'd spent all last night decorating. She even ate the wax paper. If only we had a literal doghouse. In the dog's defense, they are really good cookies. Where's Ulysses when you need him?